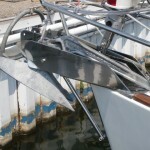 Last year we added a Manson anchor as our primary. 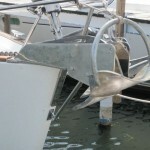 The anchor has been just great and held well in many different bottoms and wind conditions. The only downside was that with its quite non traditional shape, it would not ride well in the factory anchor roller plate. 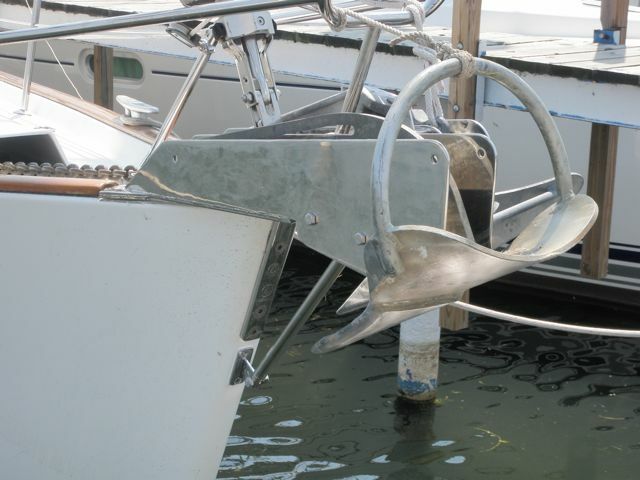 As you can see in this photo, the Manson anchor rode way up on the rollers and it also was up against the secondary anchor. 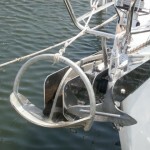 Also, the secondary anchor rode too close to the hull and was too wide to fit the space allowed in the roller plate. 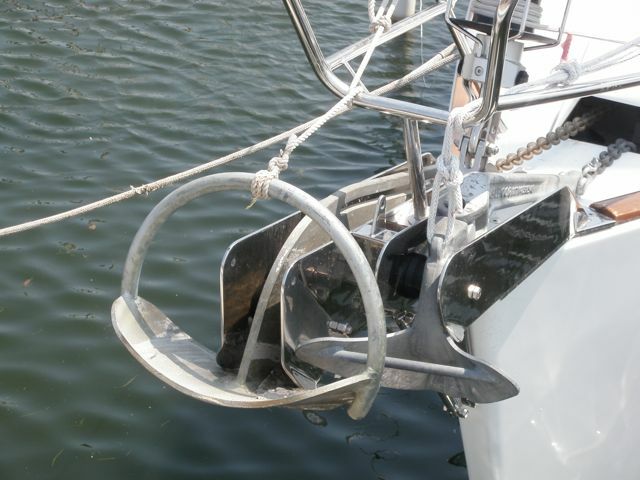 Over the winter we worked with Whitewater Marine in Port Huron to design and fabricate a new plate and roller assembly. 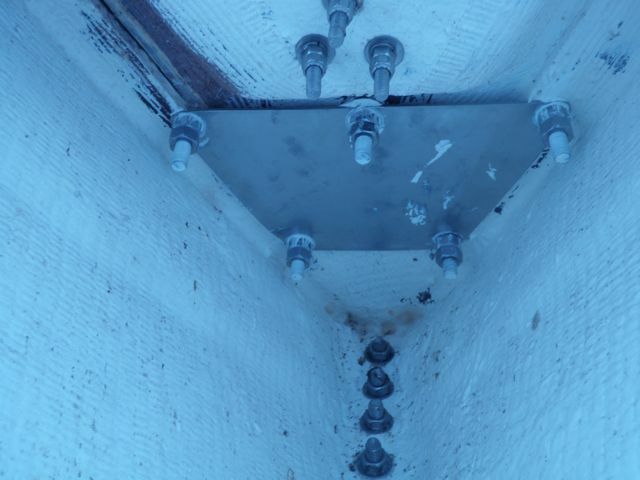 This is a photo of the completed project. 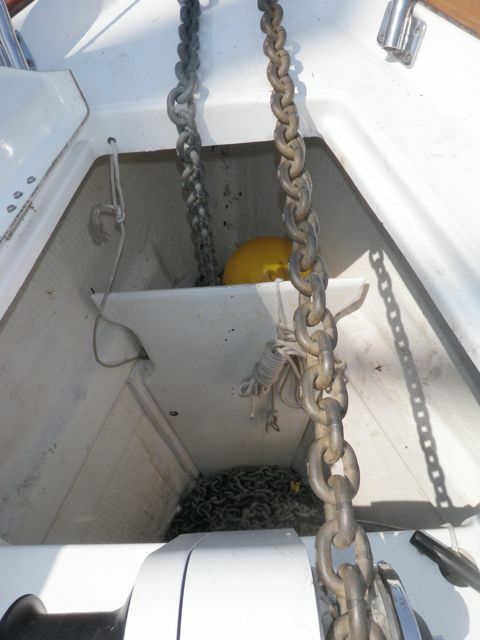 both plates were extended to move the anchors away from the hull a little bit. We also made the plate from thicker metal to make it stronger. 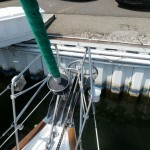 We put in a strut underneath both to provide support for the anchor chain pulling when at anchor and to oppose the spinnaker pulling up when tacked to the eye on the front of the plate. 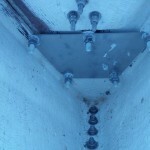 The original plate was backed up under the deck using 3/8 bolts and fender washers. The new plate we attached with 1/2 bolts and a full backing plate. 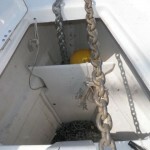 We also made a divider for the anchor lock the keep the chains separated for the 2 anchors. 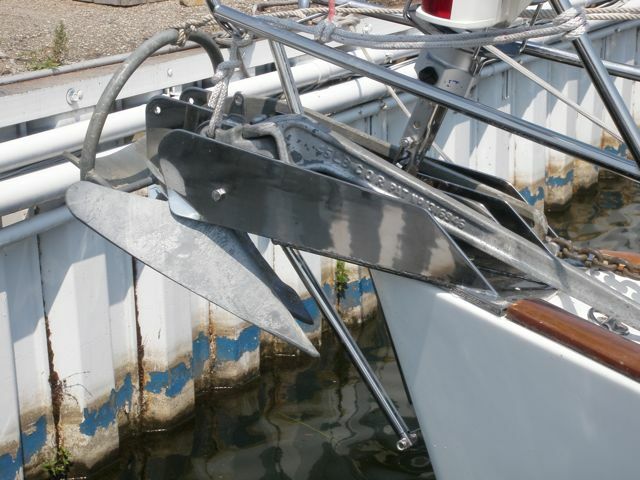 I glassed a wood stringer on each side of the hull and then screwed the epoxy coated plywood divider to the stringers. Tom at Whitewater Marine is a real artist. 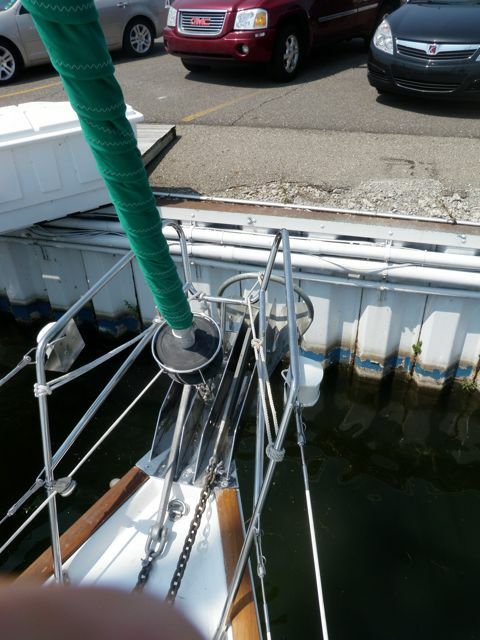 He also did our arch and I’ll be adding a page detailing the arch and dinghy davits soon. Tom kept drawings of all the details and it is a bolt on kit for a 473. This is another great project! Solid ground tackle makews a huge difference in howwell you sleep at night! 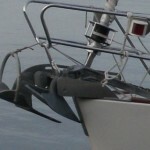 We are looking forward to the details on the arch and dinghy davits, when you get a chance. We’re reading this when you’re just about to leave Annapolis, so you’ll have more enhancements to share from your stay there. 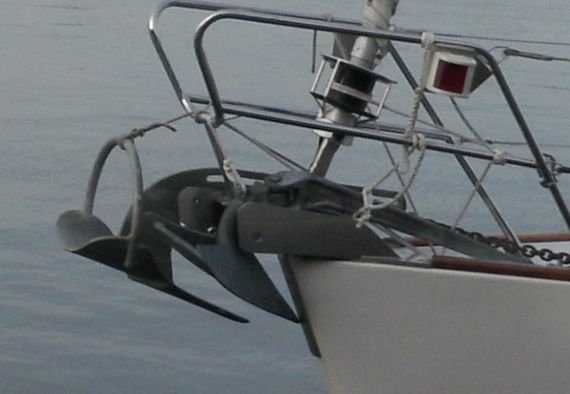 I am wondering how you configure your anchor snubber. 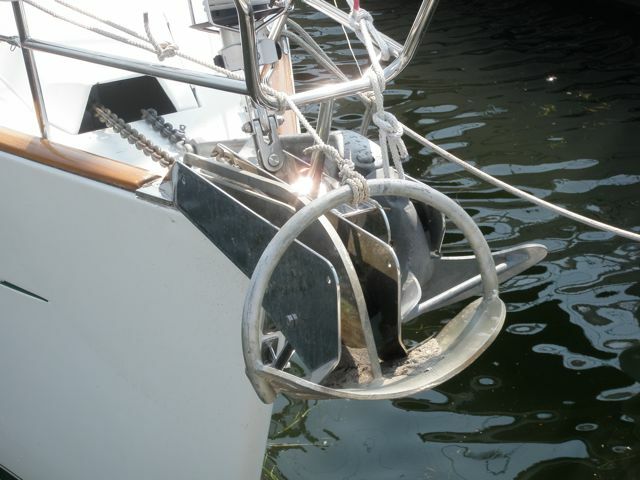 Do you run a single line to a bow cleat or a bridle arrangement to both bow cleats? I took a line about 20 feet long and spliced eyes on the ends. Then I tied a small loop in the middle. 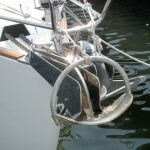 The loop goes around the chain in a bight and the two eyes drop over the cleats to form a bridle. I this is not clear, let me know and I’ll send you a photo.